Ever wondered how you would be able to differentiate a bottle of wine and a bottle of apple juice in a store, if both are packed and sealed in more or less similar container. And since, it will be sealed you will not be able to use your senses of touch, smell and taste. Thus, to make things easier for the buyers, labels are used to describe products. The information is printed on the label, which is then affixed on the container or bottle in which the product is packed. So, that the buyers can easily get the goods they are looking for, in the store. Prior the advancement in technology, the bottling and labeling were done manually which means that product is filled in manually, sealed and followed by sticking labels on the container. Wastage of products while filling in container. The package does not look attractive and professional with manual labeling. The product loses its brand name as it does not entice purchasers. The times changed with the introduction of automated filling and labeling machine. The automatic filling can easily fill product into container with no or minimal wastage. Similarly, the labeling machine can stick labels on container with acute perfection to give it a professional look. This article mainly focuses on varied series of labeling machine. The machines were evolved continuously for its versatile applications in various sectors as Food & Beverage, Chemicals, Cosmetics, Pharmaceuticals, Agriculture, and so on. The Front & Back Sides and Wrap around Labeling Machine are used to apply labels on various products such as Bottles, Vials, Ampoules, Jars, Container, Canisters, Cartons, Boxes, etc. It promotes speedy and smooth operation. It provides best results without damaging the products. Self Adhesive Sticker Labeling Machine The Self Adhesive Sticker Labeling Machine is considered as a robust machine in labeling technology. It is fully automatic, vertical, and linear which can attach stickers on any type of surface. It provides maximum output of 100 labels in a minute. It is easily controlled by PLC system. Top & Bottom Side Labeling Machine As the name suggest, top and bottom labeling machine is used to affix labels on the top and bottom surface of containers. This type of machineries is mostly used in industries involved in packaging of cosmetics, healthcare products, baked goods, etc. It is compact in size, thus space-efficient. It controls functions with the latest microprocessor and also includes an LED display. Rotary Labeling Machine Rotary labelers apply front, shoulder, neck ring and tamper seals onto widely differing container shapes. It is used for versatile products such as medicine bottle, round bottle, square bottle of any sizes. It characterized by easy operation as well as simple changeover. It delivers excellent results with less cost and energy. These are some of the evolutions of labeling machine which has made remarkable contribution in packaging industry. Why Shree Bhagwati Labelling Technologies? 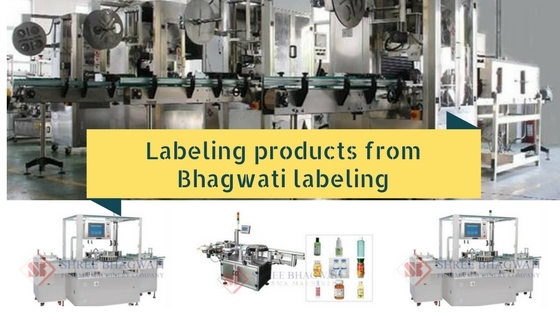 Shree Bhagwati Labelling Technologies is leading manufacturer and exporter of Labeling Machines used in varied industries. We have an advanced infrastructure, efficient R&D department and skillful engineers which promote us to manufacture high grade products. The company provides a wide range of labeling machineries which includes Bottle Sticker Labeling Machine, Front and Back Labeling Machine, Top Labeling Machine, Shrink Sleeve Applicators, Sealing machines and many more. We deliver well-designed machineries at cost-effective rates to our esteemed clients across the globe.